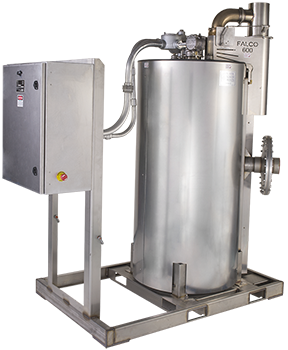 The FALCO 600 electric catalytic oxidizer treats air streams contaminated with volatile organic compounds. The catalyst provides VOC destruction efficiencies up to 99.5%. Operation, including startup, is fully automatic. Controllers accurately regulate input loading and temperatures. The controls adjust a FALCO Vapor Control Valve (VCV) to maintain safe maximum input concentrations. Automatic shutdown results if temperatures exceed limits. A spiral plate heat exchanger provides efficient heat recovery and a bypass valve allows for adjustment of heat recovery. Low heat recovery enables operation at high vapor concentration. High heat recovery minimizes energy use during operation at low concentration. At 785 ppmv (gasoline) and 600 scfm, sufficient heat is recovered to preheat the inflow without supplementary electric energy. The FALCO 600 has a massive catalyst volume for its rated capacity, providing longer life and poison resistance than monolith type catalysts. The heat exchanger, heaters, and catalyst are integrated into an amazingly compact system which is easily installed and operated. The FALCO 600 is easily integrated with a wide variety of remediation equipment. • DIMENSIONS 87" high (excluding 5' stack) X 78" long X 40" wide. Fits in the back of a pick up truck. • APPROVALS Factory Mutual Approved for use in Class 1, Div 2, Group D, T2C Hazardous locations extending up to 30” above the ground.